Today the church celebrates the feast of Saints Peter and Paul, Apostles. Each of these saints is also commemorated separately: St. Peter is honored on the day memorializing his confession of Jesus as Lord (January 18), and St. Paul is honored on the day memorializing his conversion (January 25). It could be said that these separate holidays honor their different beginnings in the faith. But today we honor them both together in remembrance of their common end: their shared martyrdom in Rome in 64 AD. Except that this wasn’t the end. They preached Christ crucified and risen, and gave their lives to building up ministry in his name. Because Christ is eternal, they now share in His eternal glory. As Christians throughout the generations have done, we remember and honor them, praying for the grace to follow where they led. In the image below, what stands out to you? This image was created for the entrance to the Vatican in the early 1600’s, just as the consequences of the Reformation took hold. (At the same time in England, translators were at work on what would become the King James Bible.) Then, it must have served in part as a statement regarding the rise of Protestantism. But the passing of time and the Anglican via media/middle way allow us to see it differently. What stands out to me in this image is its complete disregard for historical accuracy. Peter met Jesus as an adult when Jesus found him by the Sea of Galilee and said, “Follow me and I will make you fish for people” (Matthew 4:19). Paul’s encounter with Jesus occurred on the Damascus Road, and involved being blinded in a flash of light (Acts 9:3-5). 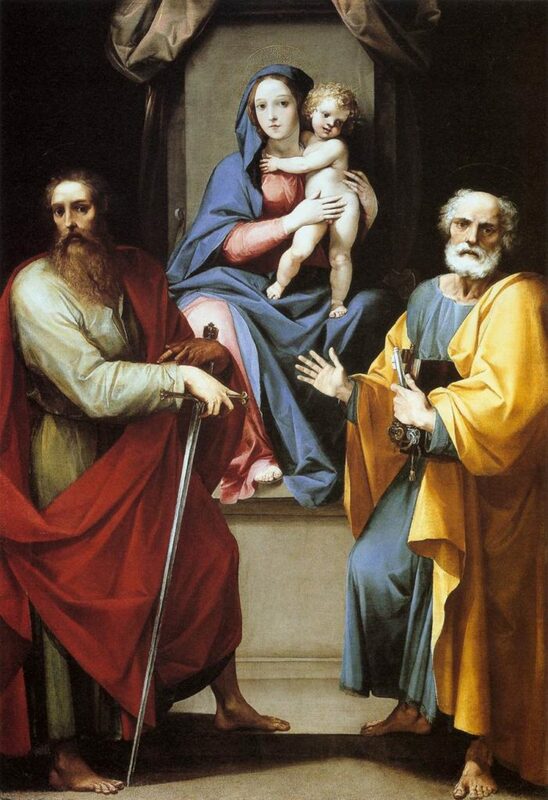 And yet the artist has chosen to show Peter and Paul as adults, each holding the symbol of their ministry, pointing to Christ as an infant being held by Mary his mother. This is an encounter that never occurred on earth. And yet the image is completely accurate in another way: Peter and Paul devoted their lives to sharing the news that in the life, death and resurrection of Jesus Christ, the one, living and holy God had entered the world and changed it forever. Here they are imaged with Christ as a babe, recalling the moment when history was forever altered by his birth. Peter and Paul were surely flawed. In fact one of the striking things about our tradition is that it captures and preserves their errors. Among the greatest stories of our faith is that of Peter’s denial of Jesus – not once, but three times. We also remember that Saul breathed “threats and murder against the disciples of the Lord.” They were granted the grace to begin again, and so are we. As an adult convert and as a parent, I take comfort in this reality. And I hope that despite my flaws, my life in some small manner reflects the glory of God in Christ, especially to my children and all those who come after me. There is no moment on earth when I met Jesus in the flesh, but like Peter and Paul in this image, I too stand at his feet. How will your family celebrate Saint Peter & Saint Paul today?